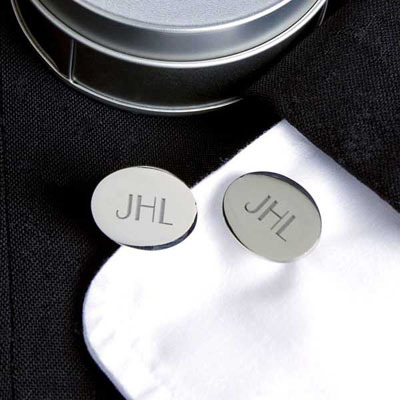 For a special occasion like your wedding, these personalized cuff links are a great way to commermorate the day with a keepsake. We love the idea of passing them down from generation to generation. Give them just to your groom or to all of the groomsmen, either way they make an affordable gift that's very special. They're a great way to add the finishing touch to your formal wear, too. For all these reasons, they earn a place in More Than Paper's gift inspiration of the week! The cuff links are oval shaped and nickel plated. They can be engraved with up to 3 initials as shown or a wedding date. Production time is usually 3-5 business days and they're just $25.00 a set! For a helpful guide to monograming, please visit our blog post about monograms. To order, please visit our website!